The Trump International Hotel in Washington is shown on December 21, 2016. Trump’s corrupt conflicts of interest threaten America’s national security, economy, and democracy; citizens, Congress, and the courts have important tools to demand accountability and exercise oversight. President Donald J. Trump’s dangerous, unprecedented, and unconstitutional business conflicts of interest pose grave risks to America’s interests at home and abroad. The full extent of Trump’s indebtedness and foreign entanglements remain unknown while he continues to hide his tax returns. Moreover, because his business and financial ties are largely undetermined there is every reason to fear that Trump will provide favors and special treatment to his business partners and that foreign states and businesses will have too much power over the Trump administration and its decisions. The public will rightly question whether Trump’s actions are made for the benefit of the American people or to further his own financial gains. This occurs even while there is a textual prohibition in the U.S. Constitution against payments to American officials from foreign governments, in order to prevent foreign corruption. Yet the Trump family continues to promote their private business interests at home and abroad. The administration has even used the White House itself to hawk family products in an outlandish display of profiting off of the presidency. Americans’ faith in our democratic institutions and the rule of law are being tested like never before. This report takes a close look at the risks to America’s national security, economy, and democracy posed by Trump’s conflicts of interest and constitutional violations. It also explores the remedies and avenues for oversight and accountability. Free and fair elections are a bedrock of democracy. Foreign interference in America’s electoral process is an assault on democratic institutions and the ability to govern ourselves freely. A majority of Americans—a full 72 percent—believe that Russia was “definitely” or “probably” responsible for hacking DNC servers and the emails of aides to the Hillary Clinton presidential campaign.33 And yet rather than ordering a full independent investigation into Russia’s interference in U.S. elections, President Trump has refused to respond in any meaningful way. The appearance of corruption undermines trust in government almost as much as clear and continuing corruption. It increases cynicism and breathes life into the notion that everyone is stealing or on the take and that no one is fairly representing the interests of all Americans as an honest broker. Already, 75 percent of Americans think that corruption is widespread in American government.41 This is a cancer that attacks people’s belief that they are being fairly represented, thus undermining the legitimacy and integrity of American democracy. On other occasions, Trump’s erratic behavior since being elected has impacted the markets. In January, Trump promoted L.L. Bean on Twitter after one of the company’s board members donated large sums of money to a pro-Trump political action committee.46 On another occasion, stock for the aerospace company Boeing fell nearly $2 per share after President Trump tweeted that he planned to cancel an order with the company to build new 747 Air Force Ones because he was unhappy with their price.47 Boeing’s stock has since recovered. In fact, the Boeing share prices reached a record high rate of nearly $172.71 on February 17, the same day Trump visited one of the company’s plants in South Carolina.48 These actions demonstrate that Trump has no compunction about using his position to favor friends and to bully those companies he disagrees with. Moreover, Trump could even use his position to target his business competitors, which is complicated by the fact that Americans do not know the full extent of Trump’s business interests since he has doggedly refused to release his tax returns. Cronyism is dangerous to the economy because it results in great uncertainty in the marketplace.50 It creates an environment where the price of a particular stock or success of a company is dependent on the mood of the president at any given moment. In addition, as noted by Scott Ross Baker, an economist at Northwestern University’s Kellogg School of Management, Trump’s approach, or “Trumponomics” to some,51 could “really change the incentives of firms. … They can start to think about, the way they can make the most money in the future is not to make the best products but to ingratiate themselves.”52 Corporate America may alter its behavior to prioritize rent-seeking over healthy economic competition.53 This type of change in market behavior, according to a Vox news report, has been associated with “lower investment and less hiring,” which is bad for U.S. companies and the American people.54 As noted by Wall Street hedge fund manager Seth Klarman, “Market confidence is threatened when the norms of a democratic society are under attack.”55 Small businesses would likely be particularly vulnerable, since they typically cannot afford to withstand financial risk or obtain lobbyists to advance their interests to the same extent as large, multi-million dollar corporations such as Boeing. By refusing to release his tax returns, President Trump has gone against a tradition spanning 40 years.73 This, combined with his failure to fully divest from his interests in the Trump Organization, leaves Americans and ethics experts in the dark about the true extent of his conflicts. 74 Simply put, Trump is not being honest with the public about his conflicts by refusing to share his tax returns. Indeed, corruption of the president, especially by way of foreign interference, was something the founders had a particular eye to when drafting our nation’s Constitution.92 In speaking at the Virginia Ratifying Convention, Edmund Jennings Randolph described the Emoluments Clause as a “provision against the danger … of the president receiving emoluments from foreign powers. … This restriction is provided to prevent corruption. It was thought proper, in order to exclude corruption and foreign influence, to prohibit any one in office from receiving or holding any emoluments from foreign states.”93 The Founders knew, for example, that any benefit bestowed upon an elected leader from a foreign entity could have dire consequences for the legitimacy of the office and the policies created therein. Steven L. Schooner and Daniel I. Gordon, professors in government procurement at the George Washington University Law School, warned, “If the president discounts the importance of avoiding conflicts, disrespects transparency and disparages the importance of compliance with contractual and regulatory requirements, the government’s credibility is at risk.”94 If the president is disregarding the highest law in the land, who will respect and enforce it? Fortunately, there are real steps that can be taken to exercise accountability and oversight and to rein in some of the most objectionable behavior related to Trump’s conflicts of interest. The judiciary and Congress, co-equal branches to the presidency with their own constitutional duties, can take actions to remedy the situation. President Trump is already being sued for violating the emoluments clause by the watchdog group Citizens for Responsibility and Ethics in Washington, led by bipartisan ethics and constitutional law scholars.99 Businesses who suffer competitive injuries are also in a position to bring suit alleging that Trump’s continuing conflicts are illegal. For example, real estate developers, hoteliers, or golf course owners could become aggrieved at losing business to Trump’s businesses from anyone seeking to curry favor with the Trump administration. State attorneys general have a crucial role in enforcing the rule of law and exercising accountability. Much of the Trump Organization is incorporated through a web of limited liability corporations. State attorneys general have the power to bring actions against a corporation if it is acting as a conduit for illegal activity. New York, where Attorney General Eric Schneiderman is reviewing a request for this type of quo warranto action, provides statutory authority for these actions in its business incorporation law.103 The basis in law is that a state is the authority for granting a corporate charter to a business seeking to incorporate, and to maintain that incorporated status the business must be operated within the law. A quo warranto proceeding could be used to determine whether Trump’s incorporated businesses are funneling emoluments to President Trump in violation of the constitution.104 As a remedy, a court could enjoin the Trump Organization from engaging in business with foreign states, require it to sell certain assets, or exercise the full power of the law to require dissolution of the corporations engaged in illegal activity. … signed ethics pledges pursuant to Executive Order 13770, ethics pledge waivers pursuant to Executive Order 13770, waivers under 18 U.S.C. § 208, authorizations under 5 CFR § 2635.502, waivers under 5 CFR § 2635.503, Certificates of Divesture and requests for Certificates of Divestiture, financial disclosure reports, ethics training records, authorizations to accept gifts of free attendance at widely attended gatherings, STOCK Act notices of employment negotiations … disciplinary actions and reprimands related to ethics violations, and any documents demonstrating compliance with ethics agreements. It would greatly facilitate accountability and oversight if these filings from high-level officials were regularly made public. 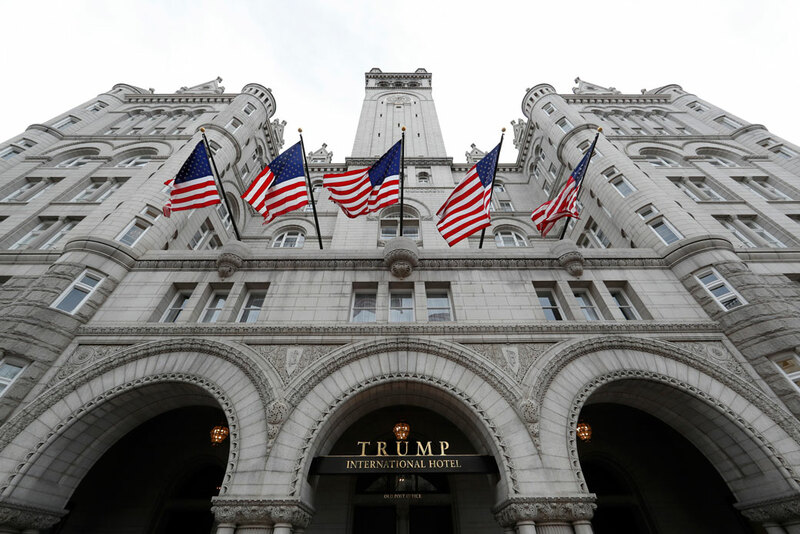 The Trump Organization has a 60-year lease to operate a hotel in the Old Post Office building in downtown Washington, D.C., administered by the federal government’s General Services Administration.124 However, a clause in the lease prevents the leaseholder from holding elected office.125 Since Trump maintains ownership of the hotel, he is benefiting from holding the lease with the government while he runs the executive branch. The role of civil society and a free press cannot be overstated. A majority of Americans believe Trump is acting illegally or unethically by continuing to own his businesses while serving as president.131 More than a million concerned citizens have signed a petition on the We the People platform on the White House website calling on Trump to release his tax returns.132 At the same time, new Pew numbers indicate that 59 percent of Americans think Trump is not separating his business interests from his administration.133 Clearly, public accountability and pressure is a crucial ingredient to making other avenues for accountability work. Investigative reporting—including on the Michael Flynn story, the former national security adviser who was forced to resign, and the larger network of ties to Russia in Trump’s circle—has already led to real breakthroughs in this still new administration. National Public Radio has reportedly set up a team to cover and investigate Trump’s conflicts.134 One of the first questions the team should ask is: What does Trump’s representation that he will direct proceeds from foreign dignitaries to the Treasury mean? And is that happening? So far since the election, the press has been diligent in its investigations into and reporting on Trump’s conflicts, breaking new revelations on almost a daily basis. This must continue if the American people are to fully understand the extent of their president’s divided loyalties and hold him accountable for his dangerous, unprecedented, and unconstitutional conflicts of interest. Liz Kennedy is the Director of Democracy and Government Reform at the Center for American Progress. Danielle Root is the Voting Rights Manager for the Democracy and Government Reform team at the Center.